This is the wild west for sure. Revelry is an understatement in this establishment where piano music is 'all request' (requests are made with six-shooters!). Seems dangerous, but sounds like they are having an awful lot of fun inside. Almost two dozen separate piano performances are never finished in this one! Distant fireworks or the occasional nearby firecracker are less than welcomed by locals (horses and donkeys). The occasional wild west wind and a full compliment of critters and birds fill out this hilarious scene. 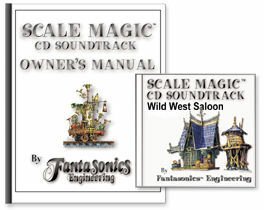 Great for gardens, our Scale Magic imaging really works and sounds terrific outdoors! CD includes day & night soundtracks.